To be a rich ruddy brown, evenly ticked with black guard hairs. Base fur dark grey to black. Belly fur to be silver grey. Foot colour to match top. Eyes black. To be a rich, golden fawn evenly ticked with silver guard hairs. Undercolour to be pale blue/grey carried down to the skin. Belly fur to be creamy silver. Top colour to be even carried well down the sides with clear differentiation between belly and top colour. Any tendency to sootiness or greyness of the top colour to be penalised. Eyes to be dark ruby (as dark as possible). 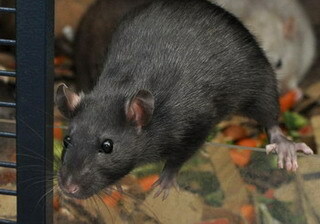 To be a deep solid black, devoid of dinginess and white hairs or patches. Base fur to be black. Foot colour to match top. Eyes black. To be a warm russet brown, evenly ticked with chocolate guard hairs. 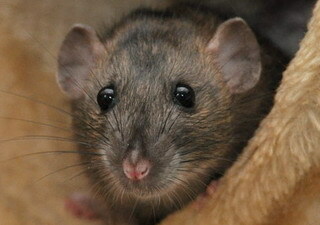 Base fur mid-grey. 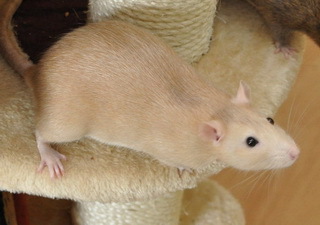 Belly fur as Agouti but of a lighter shade. Foot colour to match top. Eyes black. The ears shall be of good size, well formed and widely spaced. 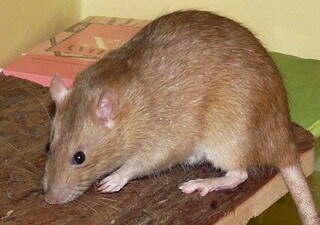 The ears to be set low on the sides of the head, their base at the back of the cheeks wider and more open than a standard rat. The ear is slightly furled at the top and should stand out at a prominent angle from the head. The ear may appear to be rose petal shaped, but should be perfectly rounded and as flat as possible. 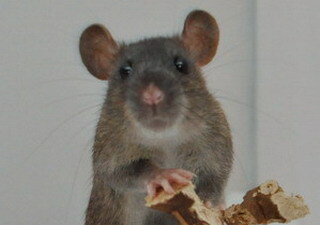 Head shape to follow the standard for normal eared rats, though may appear to differ due to the ear position. A prominent occiput (back of skull) is normal but should not present a 'hunchback' appearance. 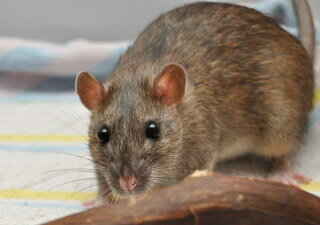 For genetic information and variety standards, visit toyah's Rat Varieties site.